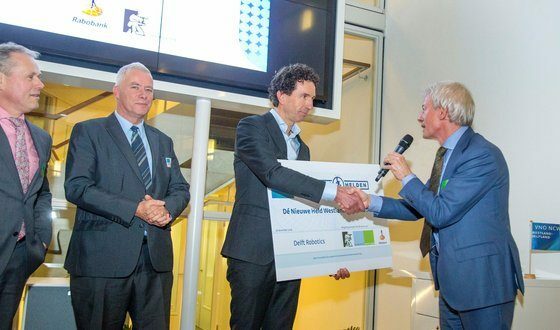 RoboValley citizen Delft Robotics has been chosen by several hundred entrepreneurs to be the ‘New Hero‘ 2016. The award is an initiative of VNO-NCW, the largest employers’ organisation in the Netherlands. Delft Robotics is, after Lacquey, the second start-up of Martijn Wisse, professor of biorobotics at Delft University of Technology. Recently Delft Robotics won the prestigious Amazon Picking Challenge, where the best robotics companies and universities of the world were challenged to detect, orientate and pick up a great variety of objects. Delft Robotics makes use of 3D Vision and deep learning. The smart, self-learning robots are able to perform repetitive tasks in, for instance, horticulture or stores. Delft Robotics is based in RoboValley, next to Delft University of Technology, and consists of 9 persons.